Download "No one was ever able to teach who was not able to learn. Florence Nightingale. 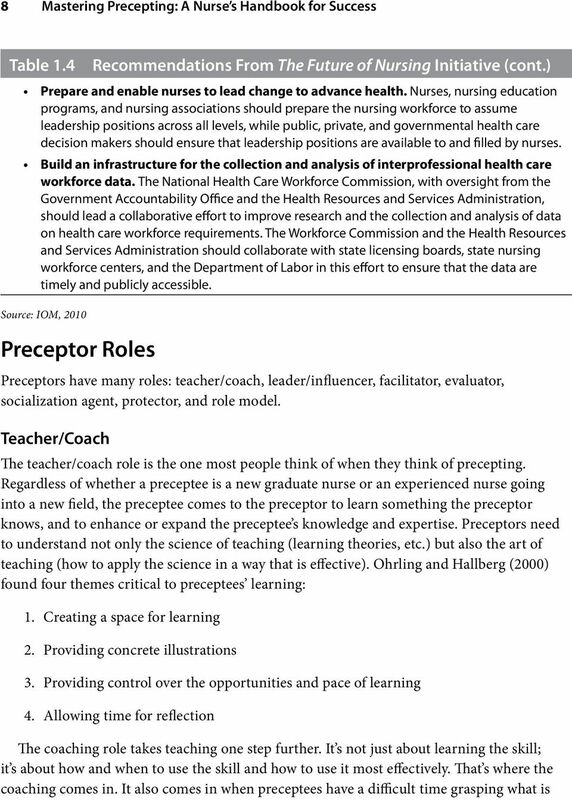 The Preceptor Role. Beth Tamplet Ulrich, EdD, RN, FACHE, FAAN"
2 2 Mastering Precepting: A Nurse s Handbook for Success Safety Professional Competence and Relationships Preceptor Roles Teacher/Coach Leader/Influencer Facilitator Evaluator Socialization Agent Protector Role Model Quality Figure 1.1 Precepting Model The Context of Precepting Precepting takes place in nursing and in the broader health care system. Professional nursing practice is complex and multifaceted. At its most basic, nursing is defined as the protection, promotion, and optimization of health and abilities, prevention of illness and injury, alleviation of suffering through the diagnosis and treatment of human response and advocacy in the care of individuals, families, communities, and populations (American Nurses Association [ANA], 2010a, p. 3). Nursing has evolved into a profession that has a distinct body of knowledge, a social contract, and an ethical code. 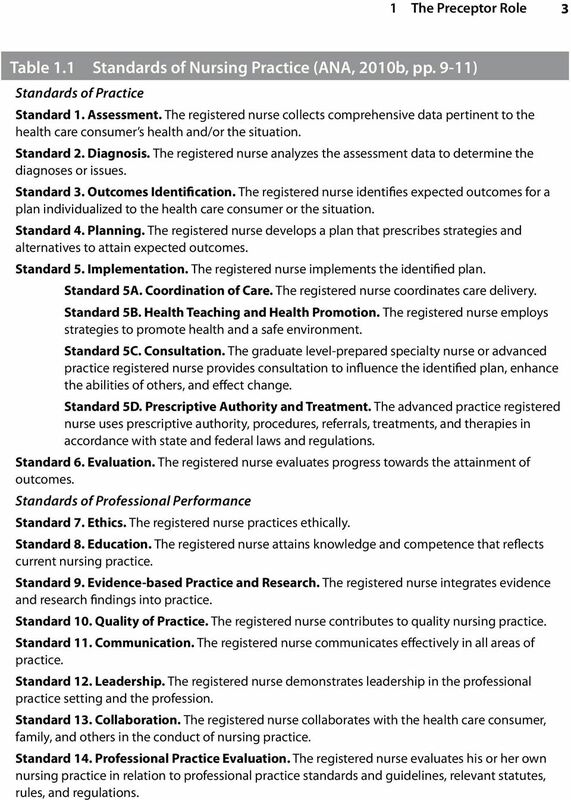 Nursing standards of practice describe a competent level of nursing care, and standards of professional performance describe a competent level of behavior in the professional role (ANA, 2010b; see Table 1.1). 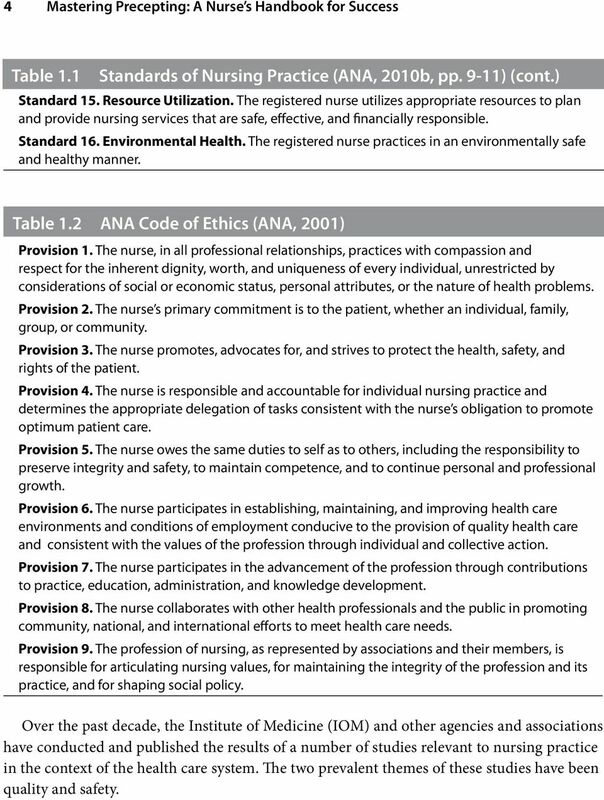 In addition, the ANA Code of Ethics for Nurses provides a succinct statement of the ethical obligations and duties of every nurse. This code is the profession s nonnegotiable ethical standard and is an expression of nursing s own understanding of its commitment to society (ANA, 2001; see Table 1.2). Preceptors need to be grounded in these standards. 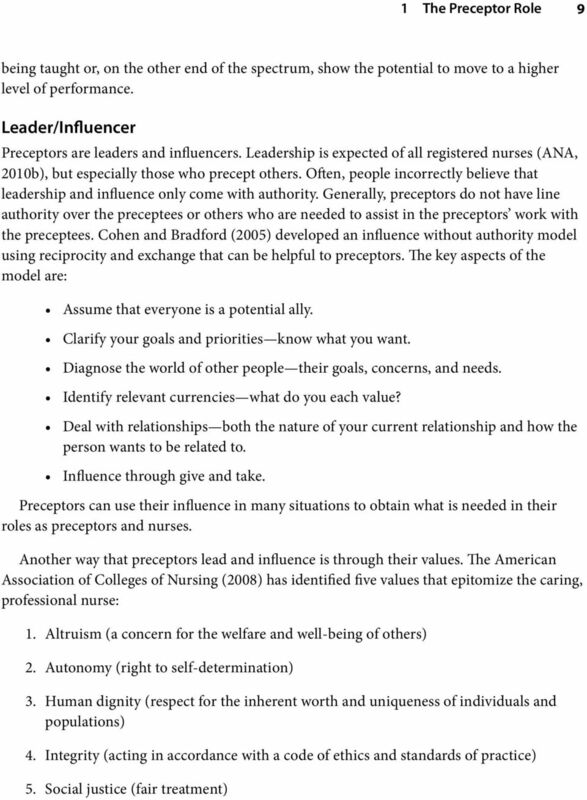 3 1 The Preceptor Role 3 Table 1.1 Standards of Nursing Practice (ANA, 2010b, pp. 9-11) Standards of Practice Standard 1. Assessment. The registered nurse collects comprehensive data pertinent to the health care consumer s health and/or the situation. Standard 2. Diagnosis. The registered nurse analyzes the assessment data to determine the diagnoses or issues. Standard 3. Outcomes Identification. The registered nurse identifies expected outcomes for a plan individualized to the health care consumer or the situation. Standard 4. Planning. The registered nurse develops a plan that prescribes strategies and alternatives to attain expected outcomes. Standard 5. Implementation. The registered nurse implements the identified plan. Standard 5A. Coordination of Care. The registered nurse coordinates care delivery. Standard 5B. Health Teaching and Health Promotion. The registered nurse employs strategies to promote health and a safe environment. Standard 5C. Consultation. The graduate level-prepared specialty nurse or advanced practice registered nurse provides consultation to influence the identified plan, enhance the abilities of others, and effect change. Standard 5D. Prescriptive Authority and Treatment. The advanced practice registered nurse uses prescriptive authority, procedures, referrals, treatments, and therapies in accordance with state and federal laws and regulations. Standard 6. Evaluation. The registered nurse evaluates progress towards the attainment of outcomes. Standards of Professional Performance Standard 7. Ethics. The registered nurse practices ethically. Standard 8. Education. The registered nurse attains knowledge and competence that reflects current nursing practice. Standard 9. Evidence-based Practice and Research. The registered nurse integrates evidence and research findings into practice. Standard 10. Quality of Practice. The registered nurse contributes to quality nursing practice. Standard 11. Communication. The registered nurse communicates effectively in all areas of practice. Standard 12. Leadership. The registered nurse demonstrates leadership in the professional practice setting and the profession. Standard 13. Collaboration. The registered nurse collaborates with the health care consumer, family, and others in the conduct of nursing practice. Standard 14. Professional Practice Evaluation. The registered nurse evaluates his or her own nursing practice in relation to professional practice standards and guidelines, relevant statutes, rules, and regulations. 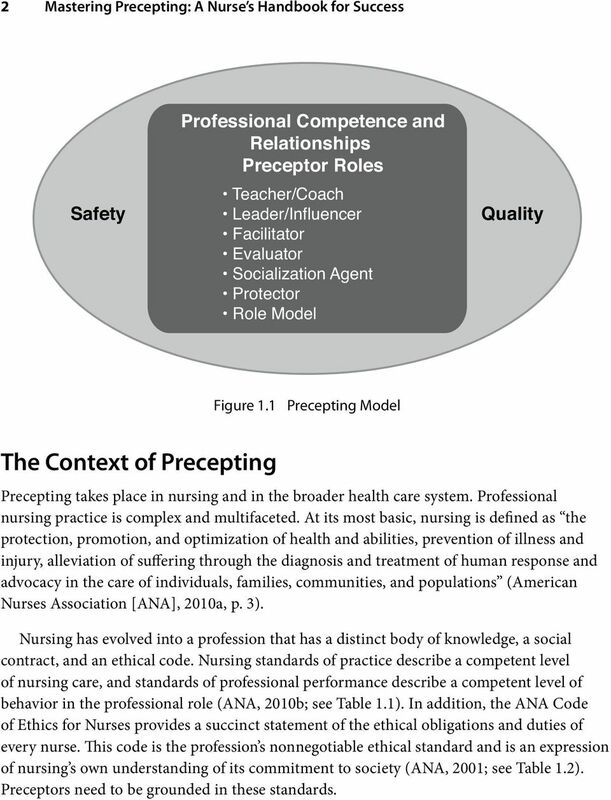 4 4 Mastering Precepting: A Nurse s Handbook for Success Table 1.1 Standards of Nursing Practice (ANA, 2010b, pp. 9-11) (cont.) Standard 15. Resource Utilization. The registered nurse utilizes appropriate resources to plan and provide nursing services that are safe, effective, and financially responsible. Standard 16. Environmental Health. The registered nurse practices in an environmentally safe and healthy manner. Table 1.2 ANA Code of Ethics (ANA, 2001) Provision 1. The nurse, in all professional relationships, practices with compassion and respect for the inherent dignity, worth, and uniqueness of every individual, unrestricted by considerations of social or economic status, personal attributes, or the nature of health problems. Provision 2. The nurse s primary commitment is to the patient, whether an individual, family, group, or community. Provision 3. The nurse promotes, advocates for, and strives to protect the health, safety, and rights of the patient. Provision 4. The nurse is responsible and accountable for individual nursing practice and determines the appropriate delegation of tasks consistent with the nurse s obligation to promote optimum patient care. Provision 5. The nurse owes the same duties to self as to others, including the responsibility to preserve integrity and safety, to maintain competence, and to continue personal and professional growth. Provision 6. The nurse participates in establishing, maintaining, and improving health care environments and conditions of employment conducive to the provision of quality health care and consistent with the values of the profession through individual and collective action. Provision 7. The nurse participates in the advancement of the profession through contributions to practice, education, administration, and knowledge development. Provision 8. The nurse collaborates with other health professionals and the public in promoting community, national, and international efforts to meet health care needs. Provision 9. The profession of nursing, as represented by associations and their members, is responsible for articulating nursing values, for maintaining the integrity of the profession and its practice, and for shaping social policy. Over the past decade, the Institute of Medicine (IOM) and other agencies and associations have conducted and published the results of a number of studies relevant to nursing practice in the context of the health care system. The two prevalent themes of these studies have been quality and safety. 5 1 The Preceptor Role 5 In its 2000 report To Err Is Human: Building a Safer Health System, the IOM discussed the issue of errors in hospitals, estimating that as many as 98,000 hospitalized Americans die each year not as a result of their illness or disease, but as a result of errors in their care. That report was followed closely in 2001 by an IOM report entitled Crossing the Quality Chasm: A New Health System for the 21st Century that identified health care quality issues, called for a radical redesign of the U.S. health care system, and proposed six quality outcomes: safety, effectiveness, patient-centeredness, timeliness, efficiency, and equity. This report also emphasized that safety and quality issues are more often the result of systems issues than of individual performance. The Crossing the Quality Chasm report was followed in 2003 by Health Professions Education: A Bridge to Quality, which focused on integrating a core set of competencies into the education of all health professionals. The five core competencies for all clinicians are: 1. Provide patient-centered care. 2. Work in interdisciplinary teams. 3. Employ evidence-based practice. 4. Apply quality improvement. 5. Utilize informatics (IOM, 2003). The Agency for Healthcare Research and Quality (AHRQ) then asked the IOM to conduct a study to identify key aspects of the work environment for nurses that likely have an impact on patient safety and potential improvements in health care working conditions that would likely increase patient safety. As a result, the IOM in 2004 specifically addressed the role of nursing and the nursing work environment in assuring patient safety in Keeping Patients Safe: Transforming the Work Environment of Nurses. 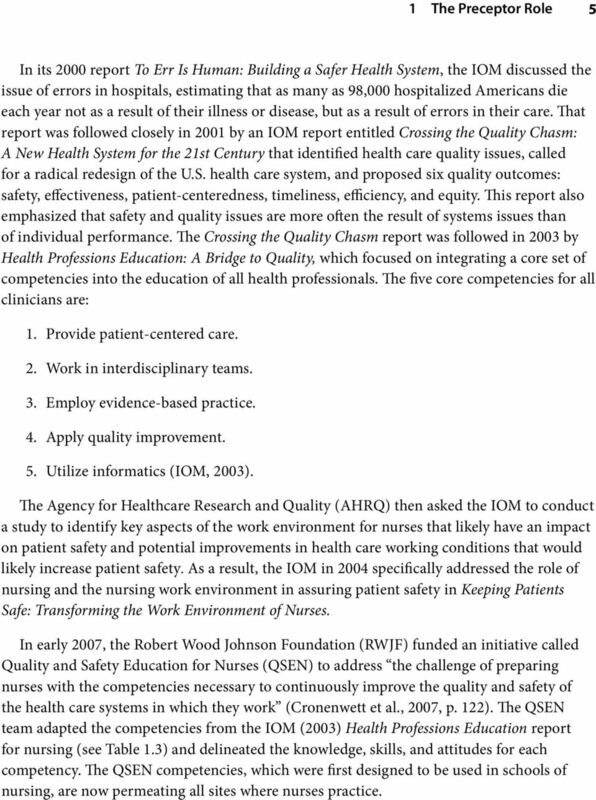 In early 2007, the Robert Wood Johnson Foundation (RWJF) funded an initiative called Quality and Safety Education for Nurses (QSEN) to address the challenge of preparing nurses with the competencies necessary to continuously improve the quality and safety of the health care systems in which they work (Cronenwett et al., 2007, p. 122). The QSEN team adapted the competencies from the IOM (2003) Health Professions Education report for nursing (see Table 1.3) and delineated the knowledge, skills, and attitudes for each competency. The QSEN competencies, which were first designed to be used in schools of nursing, are now permeating all sites where nurses practice. 6 6 Mastering Precepting: A Nurse s Handbook for Success Quality and safety are two major parts of the context in which nurses practice and, as such, are critical to precepting. In looking at the QSEN competencies, you can easily see how they could also be applied to precepting itself for example, recognizing the preceptee as a partner and assuring the safety of the preceptee and of the patient. 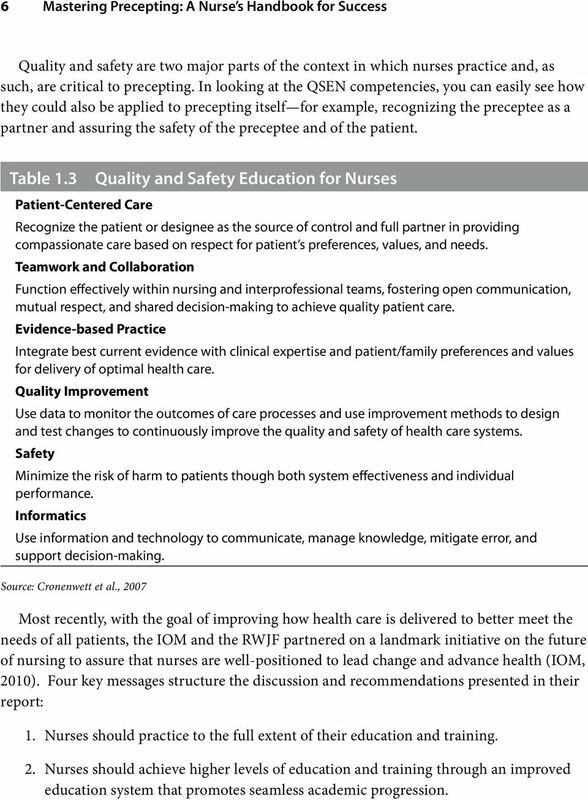 Table 1.3 Quality and Safety Education for Nurses Patient-Centered Care Recognize the patient or designee as the source of control and full partner in providing compassionate care based on respect for patient s preferences, values, and needs. Teamwork and Collaboration Function effectively within nursing and interprofessional teams, fostering open communication, mutual respect, and shared decision-making to achieve quality patient care. Evidence-based Practice Integrate best current evidence with clinical expertise and patient/family preferences and values for delivery of optimal health care. Quality Improvement Use data to monitor the outcomes of care processes and use improvement methods to design and test changes to continuously improve the quality and safety of health care systems. Safety Minimize the risk of harm to patients though both system effectiveness and individual performance. Informatics Use information and technology to communicate, manage knowledge, mitigate error, and support decision-making. Source: Cronenwett et al., 2007 Most recently, with the goal of improving how health care is delivered to better meet the needs of all patients, the IOM and the RWJF partnered on a landmark initiative on the future of nursing to assure that nurses are well-positioned to lead change and advance health (IOM, 2010). Four key messages structure the discussion and recommendations presented in their report: 1. Nurses should practice to the full extent of their education and training. 2. Nurses should achieve higher levels of education and training through an improved education system that promotes seamless academic progression. 7 1 The Preceptor Role 7 3. Nurses should be full partners, with physicians and other health professionals, in redesigning health care in the United States. 4. Effective workforce planning and policymaking require better data collection and an improved information structure. 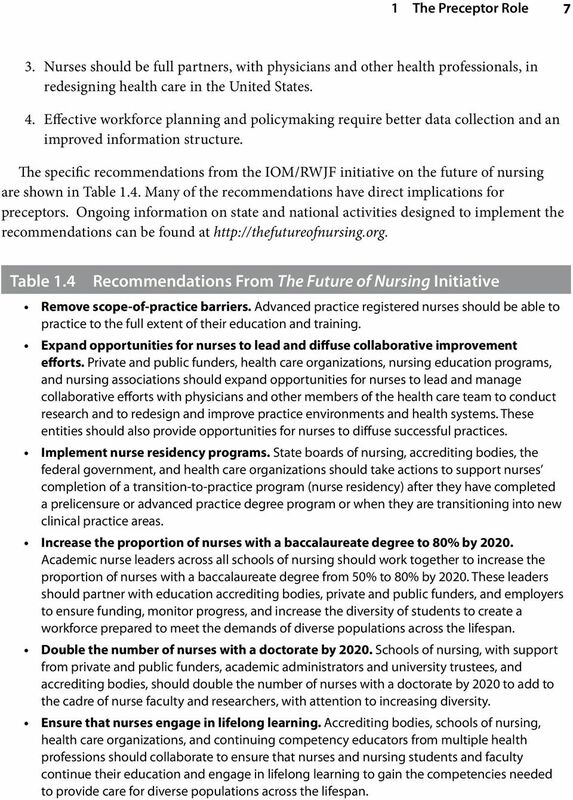 The specific recommendations from the IOM/RWJF initiative on the future of nursing are shown in Table 1.4. 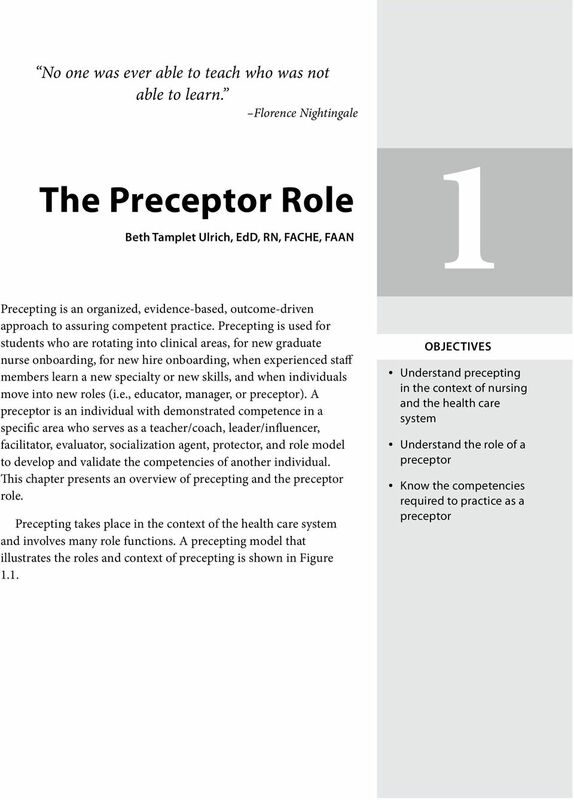 Many of the recommendations have direct implications for preceptors. Ongoing information on state and national activities designed to implement the recommendations can be found at Table 1.4 Recommendations From The Future of Nursing Initiative Remove scope-of-practice barriers. Advanced practice registered nurses should be able to practice to the full extent of their education and training. Expand opportunities for nurses to lead and diffuse collaborative improvement efforts. Private and public funders, health care organizations, nursing education programs, and nursing associations should expand opportunities for nurses to lead and manage collaborative efforts with physicians and other members of the health care team to conduct research and to redesign and improve practice environments and health systems. These entities should also provide opportunities for nurses to diffuse successful practices. Implement nurse residency programs. State boards of nursing, accrediting bodies, the federal government, and health care organizations should take actions to support nurses completion of a transition-to-practice program (nurse residency) after they have completed a prelicensure or advanced practice degree program or when they are transitioning into new clinical practice areas. Increase the proportion of nurses with a baccalaureate degree to 80% by Academic nurse leaders across all schools of nursing should work together to increase the proportion of nurses with a baccalaureate degree from 50% to 80% by These leaders should partner with education accrediting bodies, private and public funders, and employers to ensure funding, monitor progress, and increase the diversity of students to create a workforce prepared to meet the demands of diverse populations across the lifespan. Double the number of nurses with a doctorate by Schools of nursing, with support from private and public funders, academic administrators and university trustees, and accrediting bodies, should double the number of nurses with a doctorate by 2020 to add to the cadre of nurse faculty and researchers, with attention to increasing diversity. Ensure that nurses engage in lifelong learning. Accrediting bodies, schools of nursing, health care organizations, and continuing competency educators from multiple health professions should collaborate to ensure that nurses and nursing students and faculty continue their education and engage in lifelong learning to gain the competencies needed to provide care for diverse populations across the lifespan. 10 10 Mastering Precepting: A Nurse s Handbook for Success Some values are more specific; for example, timeliness, job security, peer support, and recognition. It is important to understand what you value and what others value. You can influence the values of another individual without any intention to do so. Therefore, preceptors must understand the values they convey by their words and their actions. Preceptors also need to identify when values conflicts occur. This can sometimes be especially difficult for new graduate nurses to deal with; for example, in situations in which what the patient or family wants or values conflicts with what the new graduate nurse values or wants. A significant inverse correlation has been found between value congruence and quality care, and between value congruence and nurse job satisfaction (Kramer & Hafner, 1989), making the need to resolve values differences important for both patient care outcomes and nurse retention. Values What do you value? What does your manager value? What does your organization value? 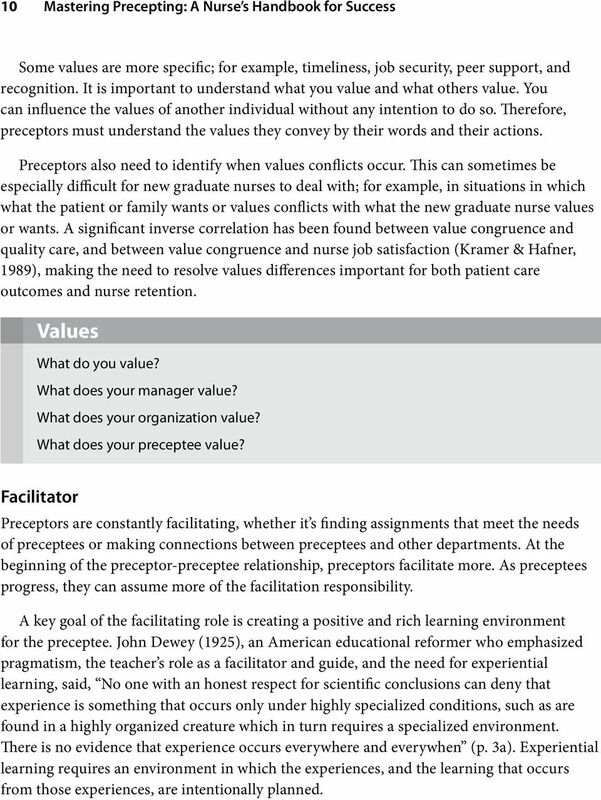 What does your preceptee value? Facilitator Preceptors are constantly facilitating, whether it s finding assignments that meet the needs of preceptees or making connections between preceptees and other departments. At the beginning of the preceptor-preceptee relationship, preceptors facilitate more. As preceptees progress, they can assume more of the facilitation responsibility. A key goal of the facilitating role is creating a positive and rich learning environment for the preceptee. John Dewey (1925), an American educational reformer who emphasized pragmatism, the teacher s role as a facilitator and guide, and the need for experiential learning, said, No one with an honest respect for scientific conclusions can deny that experience is something that occurs only under highly specialized conditions, such as are found in a highly organized creature which in turn requires a specialized environment. There is no evidence that experience occurs everywhere and everywhen (p. 3a). Experiential learning requires an environment in which the experiences, and the learning that occurs from those experiences, are intentionally planned.